This composite image shows the cloud, imaged at a distance of 90,000 kilometers (54,000 miles) during a Titan flyby designed to observe the limb of the moon. The cloud extends down to 60 degrees north latitude. Scientists have used models to help predict Earth's weather for years, but now astronomers are using similar simulations to forecast rain at a more distant locale: Saturn's biggest moon Titan. The study may help explain features such as rivers, lakes and clouds of methane on Titan, and could predict future changes, researchers said. On Earth, water flows in a cycle, raining down from the sky, running in rivers and streams to oceans and lakes, and evaporating under sunlight into mist, forming clouds that eventually rain down. Probes sent to Titan have revealed that methane flows in a cycle there in much the same way. To better understand the weather and climate of Titan, scientists created 3D atmospheric simulations of its methane cycle based on circulation models originally designed for Earth. "They have some similarities to the intense storms occurring in spring over the U.S. Great Plains," said study lead author Tapio Schneider, an atmospheric dynamicist at the California Institute of Technology in Pasadena. The simulations also hint that lakes form near the poles on Titan due to accumulation of cold-trapped methane. This happens preferentially in the north, which has a longer rainy season — Saturn's oval-shaped orbit means that Saturn happens to be further from the sun when Titan is experiencing summer in the north. In addition, the models suggest clouds form primarily in mid- and high-latitudes of the hemisphere where summer is taking place on Titan. "The results for the first time give us a unified picture of how Titan's methane cycle works," Schneider said. "What I find most satisfying is that many seemingly disparate observations — clouds, lakes, dry river beds — can be explained within one sparse and coherent framework." Upcoming space- and ground-based observations of Titan might confirm or reject predictions made by these models. 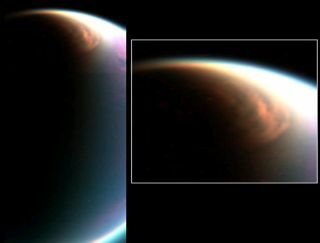 For instance, "we predict that intense methane clouds should appear in Titan's north polar region within about two years," Schneider said. "We also predict that lake levels will rise in the northern hemisphere over the next 15 years, and we give estimates of how much methane the lakes will gain."